A change in the weather is the perfect time to start something new, wouldn't you agree? This coming summer (Winter, if like me, you live 'down under'! ), Rachel from Stitched in Color and I, along with a bunch of loved and talented quilters are taking on the perfect change-of-season project, and we'd love you to join us! Rachel and I designed this quilt, inspired by our Flowers for Eleni Quilt. After having the lap quilt size in her family room for a few years now, and noting how happy it was, and how easily it went with her other makes, Rachel wanted to create another quilt like it that we could make together. Combining easy EPP, applique and machine piecing, our Kingfisher design is the perfect project for those whose next few months will see a change in routine, who get a little less machine time, that's easy to pick up with the kids at home over the Summer, or while snuggled under a quilt (for those walking into winter). It's also the perfect quilt for anyone with hexie flowers already lying around, just looking for a new home! Do you have those? The Kingfisher Quilt starts with just 46 hexie flowers, a nice number to stitch over a month or so. We estimated a busy person could stitch a couple of flowers, around 4 times a week, and get them all done in 6 weeks. Then we stitch them onto diamonds that are easily cut with a 6 1/2" wide ruler and a rotary cutter. I started a machine applique mine, and discovered I have far more time in my life for hand applique (because my machine is in my studio, and not at home), and so I switched to hand stitching. The diamonds are then machine sewn together into rows, and the borders added. If you're like me and love to switch between basting, EPP, and applique based on your mood and circumstances, this is a great quilt for you! The quilt finishes with a beautiful, modern border of easily pieced strips and appliqued triangles. We're giving you a couple of weeks to round up supplies, and kicking off the first week of June. You can buy all the papers and templates you need here in our specially made kits. And we have 2 1/2" scrap packs available for folks that would like to add a little extra scrappy to their stash! Use the code KINGFISHER15 through June 1st for a 15% discount off your entire order! Please know, you don't have to buy from us to participate! Everyone's welcome! Techy Tim and I have even developed a printable Hexie Shape Grid so that you can cut your own if you prefer. 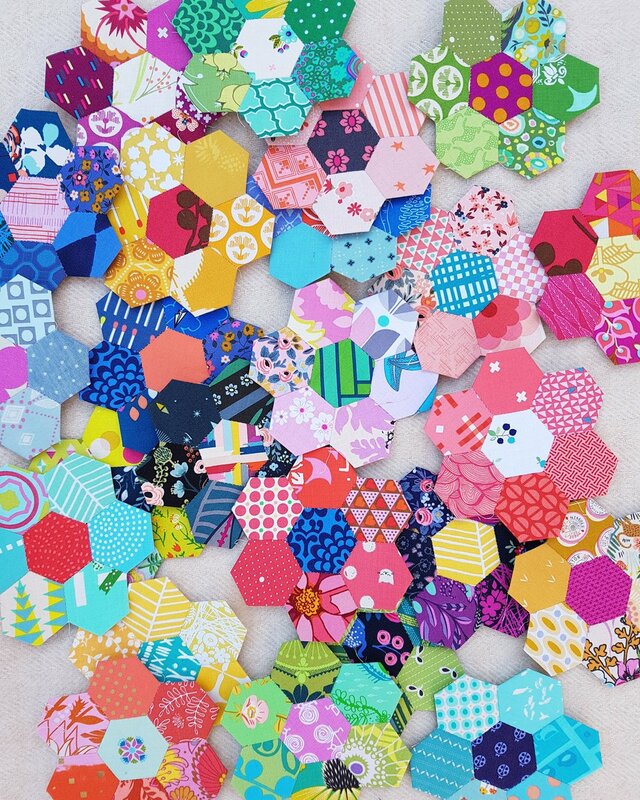 Download the printable Hexie Shape Grid here! We've designed it so that you can easily cut your hexagons in straight lines, and so that you can use it to cut out other shapes too. Find 2" diamonds, 1" Jewels and 3" triangles easily! Cut your 2" diamonds in half, and get 2" triangles! Be sure to print the page without scaling (unselect "fit to page"), and measure the 1" line before cutting to make sure it's printed correctly. Over the coming weeks, we'll take you through all the details for easy basting and English Paper Piecing, machine and hand applique, choosing fabrics, and machine piecing. You'll find a handy list of tutorials and lots of other great info at Kingfisher HQ at Stitched in Color, including a colouring in sheet so you can plan! And there's prizes! Hurray!